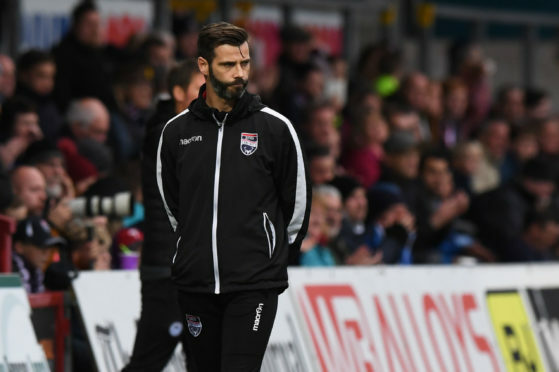 Ross County co-manager Stuart Kettlewell insists he does not expect Ayr United’s bubble to burst in the hunt for the Championship title. The Honest Men have shown excellent form following their promotion from League 1 last season, with Ian McCall’s side two points clear of the Staggies at the top of the table. Ayr underlined their credentials with an impressive 5-0 victory over Dundee United at Tannadice on Friday, forcing the Staggies to keep pace with a late 1-0 triumph at Alloa Athletic the following day. County face Ayr at Somerset Park in a crucial fixture next Saturday, following this weekend’s home match against Queen of the South, and Kettlewell does not expect McCall’s men to lose momentum. Kettlewell said: “If you are doing so well to this stage of the season, it shows you are in it for the long haul. “Credit to them for doing so. We were in a proper game up here when we played them in a game of two halves. “We are certainly not underestimating them, and sitting here hoping they are going to blow up and start dropping points. “It just goes back to taking care of our own business. I think everybody wants to talk about everybody else, and try to heap pressure on each other by doing a lot of talking away from the pitch. “We just have to take care of our own group. I think that’s what Ayr do, to be fair, as well as ourselves. They look after their own business and I’ve not heard too much out of their camp suggesting otherwise. “Credit to them – but we know our task is to overtake them, as with a few clubs behind us wanting to do the same. Despite netting late against Alloa through Keith Watson’s injury-time header, Kettlewell praised the Dingwall side’s display at Recreation Park, adding: “When you look at the time of the goal and the scoreline, you think we have dug deep. “We felt we had our best performance in the last month. Alloa showed brilliant resistance and defended very well, their goalkeeper was outstanding on the day. He pulled off some fabulous saves. County will be boosted by the return of winger Michael Gardyne to training this week, having missed the last two months with a broken foot, however Kettlewell says the 32-year-old will be eased back to action. “We are hoping to get Michael Gardyne back on the training pitch this week which is massive, given the period of time he has been out.